We've got plenty of snow and now the temperature is plummeting again. Christmas was slow and peaceful — just as we want it. Not very different from any other winter day. I know that a lot of people would find our Christmases very dull. Besides the Christmas tree we don't have any decorations — unless you count all the Christmas cards that fill the walls in the staircase. And no abundance of food — I simply can't see the point of overeating, just because it is Christmas. Cities are nice to visit, but I'm so happy that I live in the countryside. 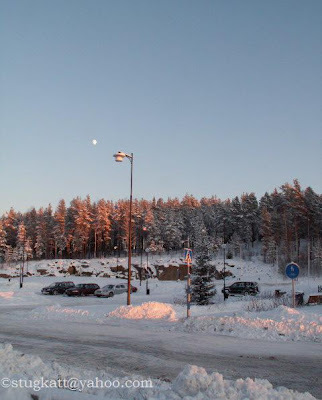 This is the view that meets me when I step out of our grocery store. Really beautiful, Em. I live in a beautiful place too, close to farms but with a National Park a few miles away. Lake Erie a half hour drive (but only about five minutes from where I grew up.) It makes a difference to always see so much beauty all around. The first photo, what a gorgeous red against the white snow. What a blessing to be surrounded by such beauty. I'm sure I could live anyplace - and like it if I had to. But having a choice I'd choose the countryside. A walk along the rivers always lift my spirits. 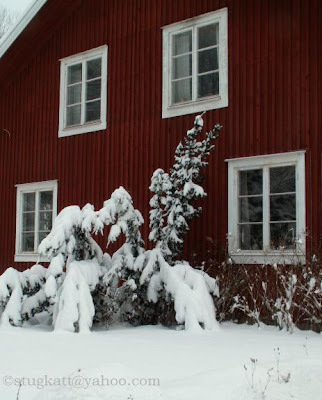 Thar red color is typical for Swedish houses - the color is a bi-product from the copper mines and preserves the wood. Funny (funny ha ha, not peculiar) how we get used to elbow room. We refuse to eat our picnic if you can see anybody else on the beach, while people in crowded countries come and sit almost in your lap, even if the beach is empty. Thanks a lot for your kind wishes which I'd like to return to you too. Actually we are staying in Adelboden, hoping to have some more snow than where I usually live. But it is raining all the time. Never mind. It's also nice to stay inside and to read some of the books I got for Christmas. Your pictures are beautiful and I understand why you love to live in the countryside. I do love it too :-) !! Visst är det något särskilt med röda hus! I'm sorry you have such a bad weather - want to swap? Even if you have to stay inside, I hope it is clear enough for you to see the mountains.